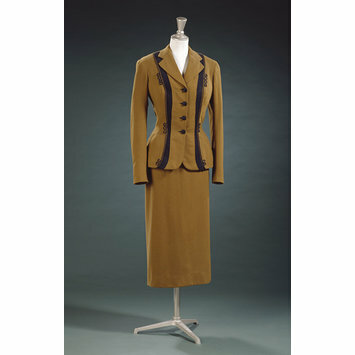 The year he closed the long-established House of Creed (1966),Charles Creed gave this suit to the Victoria and Albert Museum to represent his work. The ensemble reveals his refined and sophisticated tailoring skills and deft use of colour and decoration. The jacket has inset bands of black braid, flanked by black gimp, looped in a semi-military manner. The braid is repeated down the skirt's centre-back kick pleat. It retains the original tape, bearing the model number 1523 and the name "Toffee". 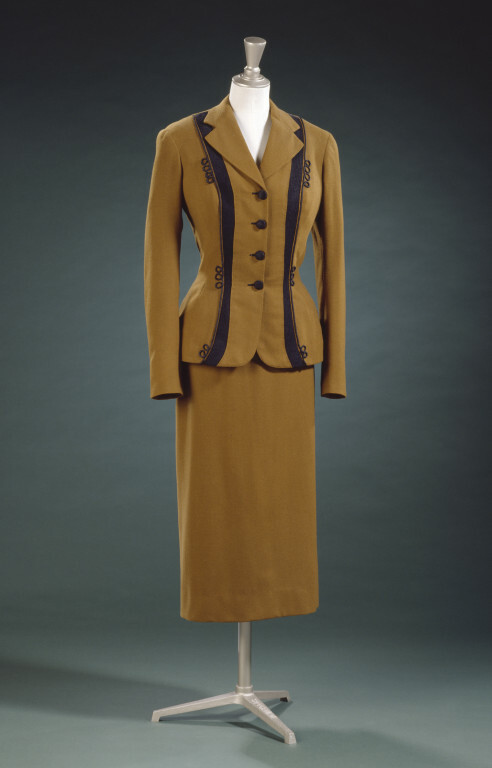 Ladies suit consisting of a jacket and skirt of toffee-coloured wool. The jacket is fitted and hip-length with a four-button single-breasted fastening. The lapels are medium-wide and the sleeves are set into the slightly padded shoulders. The front of the jacket is trimmed on each side with an inserted line of wide black woollen braid, flanked by black gimp, which runs from under the collar to the bottom of the jacket. On the outside of this braid band is stitched a line of black silk cord forming two sets of triple loops and a double loop in a semi-military manner. The button-holes are stitched in black, and the silk basket weave buttons are also black. The jacket is lined with black silk crêpe. The skirt is straight-cut with a kick-back pleat at the centre back and is trimmed with a band of black woollen braid and a black silk cord like the trimming in the jacket. It fastens on the left hip with a white petersham waist band with two hooks and eyes, and there is a brown metal zip on the hip. de la Haye, A., 'Material Evidence' in Wilcox, C. ed., The Golden Age of Couture: Paris and London 1947-1957 (V&A Publications, 2007), p.96-7 & pl.4.6. Creed's Knightsbridge premises were unusually masculine. Cavalry hats hung on the dark panelled walls, and the salon displayed his collection of miniature Napoleonic soldiers. This passion for military uniform was translated into the couture collections. Garments trimmed with frogging, braiding and piping became Creed signatures, along with capes, tricorn hats and fobs in place of buttons.